Charles is a pioneer of organic and no dig growing since 1983, creating and cropping four market gardens, the largest of seven acres. His no dig method is being trialled and used by the RHS, National Trust gardeners and Kew Gardens London. 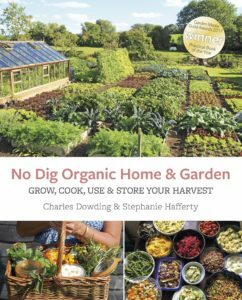 He has written nine books, including the best-selling, Organic Gardening – The Natural No-Dig Way, a self-published Diary book and a joint book with his partner Stephanie Hafferty. He runs a busy YouTube channel, lectures and runs courses both at home and abroad, is on gardening TV programmes and writes for national magazines.